Jack Holden trained at the Bristol Old Vic Theatre School and played the title character of David Copperfield in a tour of the West Country. He also toured schools in the Bristol area as Prospero with a special educational production of Shakespeare’s The Tempest and has starred in several other plays, such as Schiller’s Don Carlos at the Edinburgh Fringe and Annie Baker’s The Aliens at the Trafalgar Studios. He has also appeared on ITV (sixth series of “Lewis”) and BBC Radio 4. 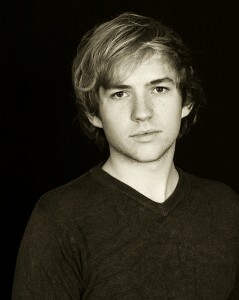 Jack joined the cast of the West End’s most popular play, War Horse, last November as young Albert, the lead role. He has kindly answered some questions about his life and career – I’m sure you’ll enjoy this great interview! I think I wanted to be a stuntman first. I loved playing soldiers and stage fighting but, when I took GCSE Drama, I realised I wanted to do more than just combat-related drama… Yet, here I am in ‘War Horse’! Did anyone in particular inspire you and have you got any role models? My school was very academic and didn’t offer a Drama or Theatre Studies A Level, so I was pretty unusual in wanting to pursue Acting as a career. But my old head of Sixth Form, Mr Griggs, was an opera singer who trained at Guildhall and he taught me that there’s more to life that meeting the expectations of others. He taught me to sing as well. I owe him a lot. My acting role model is Philip Seymour Hoffman. He’s brilliant in everything he does. You studied at the Bristol Old Vic Theatre School. Did you enjoy your time there? On the whole, I absolutely loved my time at BOVTS. The small size of the school, its location and its classical history make it such a relaxed and friendly environment. But, as with any drama school, it’s tough at times, you go through massive highs and lows and you question everything you’re being taught. Highlights were: touring the West Country with David Copperfield, working with the student directors and plenty of stage combat! A couple of years ago, you played Prospero in Shakespeare’s The Tempest, touring primary and secondary schools in the Bristol area. This sounds like a very interesting project. How did you manage to get the kids interested in Shakespeare and is this something that you’d like to do again? Two words: Toby Hulse. He was our brilliant director and he’s an incredible drama workshop leader for schools. We started with a pared-down, half-hour version of The Tempest, then we devised ways of clearly telling the story. When you approach a play about spirits, wizards and shipwrecks with the objectives of clarity and simplicity, it’s not hard for children to be interested. I love that kids are so vocal and honest in their reactions to theatre: if they’re enjoying it, they’ll let you know; if they’re bored, they’ll be shuffling around, yawning, asking to go to the loo. For that honesty, I’d love to do more Theatre In Education. You have also appeared in other demanding plays such as Schiller’s Don Carlos, Dickens’ David Copperfield and The Aliens by Annie Baker. What is it you like about the more ‘serious’ roles? Each role usually presents one or more serious challenges, but I’d never call any role ‘serious’. Real people don’t think about themselves in terms of ‘serious’ or ‘comedic’, they are real people placed in, what may appear to the outsider to be, serious or comedic circumstances. A serious challenge in playing the part of KJ in The Aliens by Annie Baker was a monologue of the word ‘ladder’ repeated 120 times. This word takes control of KJ at a very serious time – his best friend has died, but the results are comedic and tragic in equal measure – a ridiculous word, but one which is holding so much pain. Would you like to appear in a comedy? Or in a musical? Regardless of the pretentious spiel above, I’d love to appear in a comedy and I’d love to be in a musical – preferably one of the classics like My Fair Lady, Barnum, Singin’ in the Rain, A Little Night Music etc. After the relative heavy subject matter of World War I, a lighter piece would be nice! You are currently starring in War Horse at the New London Theatre, playing young Albert – Joey’s two-legged friend. What was the audition process like and how did you feel when you learned you had landed the role? Just getting seen for the part of Albert was exciting. The first audition was at the National, reading some of the scenes opposite the associate directors, assistant director, producer and casting directors. I’d learnt my lines, which I always do if I have time. The second round was a week later, on the stage of the New London Theatre, working with the horses: quite an awesome experience in itself. The next evening I got a call from my agent saying, ‘I’ve got some pretty f***ing good news for you, Jack…’ When she told me, I’m ashamed to say it was like all the worst X-Factor moments – speechless, punching the air, screaming. Cringe. How would you describe Albert to someone who has not seen the play? Albert starts the play as a regular 15-year-old boy in rural Devon in the early 20th Century… he works the farm, he’s had a basic education, he’s not travelled much further than the nearest town. He has a turbulent relationship with his heavy-drinker of a father. When Joey, the horse, comes into his life, he suddenly has a focus, aspirations, a project and passion. It is this passion that drives Albert from start to end. He loves Joey, he will do absolutely anything to keep him and protect him – including joining the army to follow Joey to France and fight in World War I. He appears to have a one-track mind… and with the quality of life he faces on the farm and the volatile relationship he has with his parents, who can blame him? Were you familiar with horses and horse-riding prior to auditioning for War Horse? If not, (how) did you prepare for the role? I wasn’t really familiar with horses, aside from riding friends’ horses and riding horses on holidays. I visited an equestrian centre near to where I live, swatted up on riding lingo and the whole cast were taken on research trips to stables and to the King’s Troop, one of the last remaining cavalry regiments. Now Joey is a (fantastic!) and larger-than-life wooden puppet, visibly operated by puppeteers. What I found amazing when I saw the play is that you completely forget about that. For you as an actor, while on stage, do you perceive Joey as more than a puppet, too? More like a (four-legged) fellow actor (or is this a silly question)? The reason you forget about the puppeteers is that they are so very good at what they do. The movement, the breathing, the sounds, the attitude, the sheer horseyness of them makes it easy to suspend your disbelief. And, for the human actors, because the three puppeteers operating the puppet are so in sync, it is just the same as acting opposite a single actor. Why do you think War Horse is as popular and successful as it is? Three reasons: Morpurgo, the National, Handspring. Michael Morpurgo wrote a beautiful children’s book, which fell into the talented hands of Tom Morris and Marianne Eliot at the National Theatre, who had the time and money to develop a grand, spectacular adaptation, employing the magical craftsmanship of Handspring Puppet Company. When these stars aligned, they made a show with such universal appeal, with a visual concept so original and unusual in Western Theatre it was bound to be a national success. Now, of course, it’s going international! Have you seen War Horse the film? If so, what did you think of it? Everyone who’s ever been involved with the play was invited to a screening of the film in Leicester Square. It was a really weird experience, as much of the film script was taken directly from the stage script. I thought what it gained in Spielbergian grandeur and epic scale, it lost in Morpurgoesque simplicity and innocence… if that makes sense?! In your opinion, what is it that a stage production can offer that a film cannot? The puppets. We ask the audience to invest a lot of faith in us – believe that the puppets are real horses, believe that we’re in a muddy field, believe that we’re now in France, try and work out what they are saying in French and German. In the film, this is all done for you, and, as the old phrase goes ‘you’ll only get out of something what you put into it’. You’ll feel part of a shared experience if you see the show. 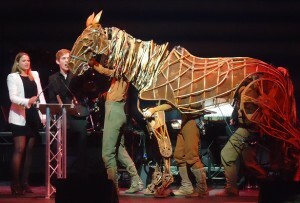 War Horse won the 2012 Whatsonstage Award for ‘Best West End Show’ last month. Congratulations! What did this mean to you? I felt quite fraudulent collecting the award, as I’ve only been in War Horse since November 2011, but I’m so proud to be a part of such a popular show and for a play (not a musical) to be so successful and long running in the West End nowadays is great news for theatre as a whole and, more specifically, the National. Singin’ in the Rain. I love the classic MGM musicals and to see it on stage would be awesome. I’d like to see She Stoops to Conquer as well – I love Steve Pemberton! In rehearsals for War Horse, I fell off the horse! In the play I have to mount Joey (the full size horse), unaided, with a small run-up. I was so desperate not to fail that I sprung up onto his back and flew right off the other side! Much to my embarrassment, the whole thing was filmed. The footage will come back to haunt me, I’m sure. Only good thing is that it wasn’t in an actual show! I’d like to work with Phil Davies – he’s in everything on TV and he’s always good. I’d also like to work with Steve Pemberton and Reece Shearsmith – I loved the League of Gentlemen and Psychoville, I’d love to be in their next dark comedy. The dream would be to work with Philip Seymour Hoffman. You play Ben Newbound in ITV’s sixth series of Lewis – your first TV role. Please tell us about this experience. One day, crash-course in big-budget, ITV drama filming. Got to work with Freddie Fox, Roxanne McKee, Kevin Whately and Laurence Fox, which was cool, but my part in the episode will be quite fleeting! More substantial experience soon hopefully. Your voice could be heard in the BBC Radio 4 play Positive last year. What was working for BBC Radio like? I like to cycle – I got a wicked racing bike for my 21st birthday. Riding it in the streets of London is an extra adrenalin rush! I also like to go to the cinema. I love film and you can’t beat escaping from the busy streets to see an afternoon showing of a film on a huge screen. I’m getting excited just thinking about it! And cooking – Delia Smith is a goddess. Pets? All had unfortunate deaths. True story. Career highlight so far? Landing Albert in War Horse, of course! And getting my agent. Your favourite book? David Mamet – True and False. Read it. Cinema – The Woman in Black or The Iron Lady? Regardless of it’s historical accuracy, Meryl Streep is breathtaking, so The Iron Lady. Pub or Night Club? Pub, pub, pub. Favourite holiday destination? LA… or the Isle of Skye, Scotland. I’m leaving War Horse on 1st September 2012, so if you want to see me in it, book before then. After that, who knows where I’ll be… Follow me on Twitter @jackholdenactor. Thank you so much for this brilliant interview, Jack and all the best for your time in War Horse!